Shanghai University is home to one of approximately 10 American Studies Centers in China. Funded by a grant from the Public Affairs Section of the U.S. Embassy in Beijing, and pioneered through a joint-venture agreement between SHU and UK, the center began operation in 2011. Since then the facility has served to emphasize the diversity of American culture and experience, to broaden Chinese understanding of American culture and to foster intellectual and cultural exchange. UK's primary contribution involves providing a perspective of the American South and Appalachia through symposia, lectures and other events. This partnership also facilitates Shanghai students coming to visit UK. 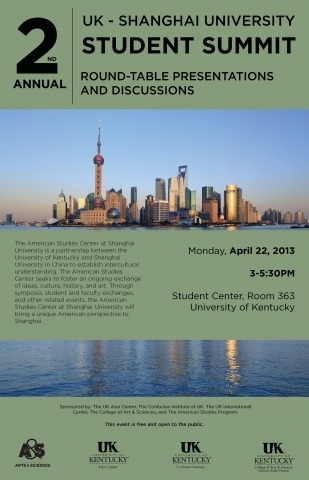 The Shanghai student summit will take place from 3-5:30 p.m. in the Student Center, Room 363. Eighteen graduate students: 10 from SHU and eight from UK, will deliver short presentations of their research. The roundtable format invites discussion from the audience. UK professor Andy Doolen, director the American Studies Center in Shanghai, said that events like this are central to the mission of the UK-SHU partnership. "The purpose of the center is to try and counter Hollywood stereotypes of the United States by bringing them a more nuanced version of American society," Doolen said. "Our center is rare because most U.S.-China exchanges revolve around business and technology, whereas this facility explores the more profound cultural connections and relationships between Kentucky, the U.S. and China." Last March and last May, the American Studies Center sent cohorts of UK students and faculty to the center to engage, interact and present their research to their counterparts in Shanghai. UK faculty that have presented at the center include Richard Schein and Patricia Ehrkamp from the Department of Geography; Doug Boyd, director of the Louie B. Nunn Center for Oral History; Ron Pen from the School of Music; Frank X Walker and Michelle Sizemore from the Department of English; Mary Anglin from the Department of Anthropology; and Arturo Alonzo Sandoval from the College of Fine Arts. These events will continue to facilitate the academic and cultural exchange between the University of Kentucky and Shanghai University. The partnership provides potential opportunities for joint research ventures, opportunities for UK students and faculty to visit and study in China and to bring Chinese scholars to the U.S.